St Mary’s, West Malling is delighted to help kick-off your Advent preparations with a special Christmas Tree Festival on the weekend of December 1st and 2nd this year. 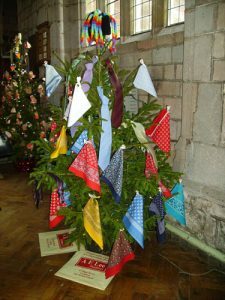 A new experiment for West Malling, we have invited a plethora of local organisations, charities and businesses to come to church that weekend and set-up their own Christmas Tree and promote their activities. 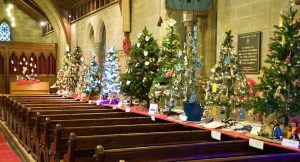 We are pleased to say that around 20 separate groups are coming and the church will be festooned with wonderful and very different trees. Entrance is free and you can come along anytime between 12 noon and 6 p.m. each day on Saturday the 1st of December or Sunday the 2nd of December to see the trees. Donations are welcome and refreshments will also be available. If you come along on Sunday, why not combine it with a trip down the High Street to take part in the switching on of West Malling’s Christmas Lights. This is the complete rundown of all the Advent and Christmas special events and services taking place in Offham and West Malling this year. St Mary’s, West Malling. Find out more on this website. St Mary’s, West Malling. Find out more on the WMCC website. St Mary’s, West Malling. Find out more on the HoKH website. St Mary’s, West Malling. Find out more on the Vox Anima website. An afternoon candle-lit service for all the family with carols, a family-friendly talk from our Vicar and Christingles for all the children. Jamie Meaders will lead a choir of over 100 people in rehearsals from 2pm onwards with anyone welcome to sign-up to ‘Come and Sing’. £15 per singer. At 6pm, accompanied by soloists, strings and harpsichord, we will sing together the Christmas portion of Handel’s Messiah. Hallelujah! 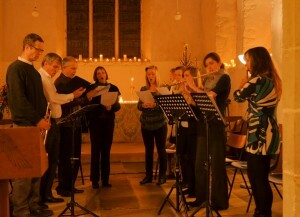 An evening candle-lit service of Christmas readings and carols with guest Richard King and friends leading a special guest choir to complement the congregation’s singing! The King’s Arms play host to an evening of carol singing with the odd glass of mulled wine in three to lubricate the vocal chords! Readings and carols telling the Christmas story. Come and take part in the pop-up choir being organised by our new Director of Music, Richard Hall, or come and be part of the congregation. 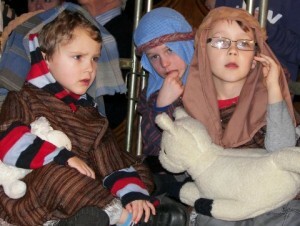 Candle-lit Crib service with a Nativity play from St Mary’s Sunday School and lots of carol singing. Christingles will be distributed at the end for children. Come early to avoid disappointment. If you miss out, you may like to come to the second service at 5 p.m (see below). Often attended by families with pre-school children but all ages are welcome. A repeat of the 3.30 p.m. service. Candle-lit Crib service with a Nativity play from St Mary’s Sunday School and lots of carol singing. Christingles will be distributed at the end for children. Doors will not open until after 4.30 p.m. when the previous service concludes. Often attended by families with primary-age children but all ages are welcome. 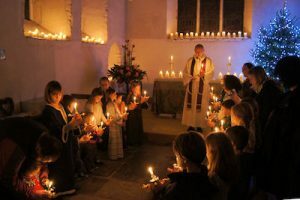 The first service of Christmas Day is a traditional Midnight Mass with Carols and Holy Communion. Traditional language, reflective and quiet Book of Common Prayer Holy Communion service. Child-friendly Eucharist service to celebrate Christmas Day. 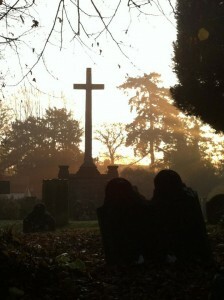 There is no 8 am or 10.00 am service at St Mary’s, West Malling on this Sunday. Instead, we come together as one congregation for a joint Benefice service. Rev Jim Brown will be leading and we gather at St Michael’s, Offham. For each of our three communities, please find below details of the Remembrance Sunday services. The Sunday service starts at the slightly later than usual time of 10.00 a.m. and will follow the pattern for Churches Together services of remembrance. Rev Jim and Rev David will both be on hand to take part in the serviec. After the service, just before 11.00 a.m. we will make our way outside to the War Memorial for the Act of Remembrance and the two minutes silence. The congregation will be invited to join the Minister outside the church at the War Memorial where the names of the dead will be read aloud and wreaths laid. The Sunday service at West Malling will be a service of Holy Communion, led by Canon Alan Vousden. Following the service, the congregation will make its way outside to the War Memorial for the Act of Remembrance and to observe two minutes silence at 11 o’clock. A special joint service takes place at 10.30 at the Running Airman Memorial on Gibson Drive with use of the Italian Market for larger crowds. Uniformed organisations will parade from the Control Tower to the Memorial for the service. Rev Matt Ross of Kings Hill Christian Fellowship and Rev Mark Montgomery of the Church of England will be leading the service. The Civic Service for Remembrance Sunday will take place at 2.30 p.m. in the afternoon. A parade will make its way up the High Street from about 2pm onwards. Please note the High Street will be closed to traffic while the parade is going on. This year we mark the centenary of the end of the First World War, and also the centenary of the beginning of the RAF with our local links to RAF West Malling. Rev David Green will also be on hand to participate in the service alongside other ecumenical guests. After the service, wreaths will be laid at the War Memorial while the uniformed organisations form up in the road. Once again, the High Street will be closed around 3.30 p.m. in order for this to take place. This year, Rev Dave Baxter of West Malling Baptist and Rev David of St Mary’s will re-dedicate the memorial following the renovations that took place this year. In so doing, they will mirror what took place in 1921 when their predecessors first unveiled and dedicated the memorial for the people of West Malling. More details are available in the Events section of this website. The eighth Music@Malling Festival takes place in West Malling this month and St Mary’s is pleased to be one of the host venues. Combining a hugely successful outreach programme with a firm commitment to new music, the eighth Music@Malling festival comprises 28 events across 14 days. 1,800 children from 20 primary schools compose theme tunes for the theme park rides in The Great Enormo – a 21st Century Young Person’s Guide to the Orchestra, written by Michael Rosen and set to music by husband and wife team, James Morgan and Juliette Cochin. One of the world’s leading choirs, Tenebrae, under their acclaimed director, Nigel Short, give a concert Commemorating The Armistice performing works by Elgar, Stanford, Parry and Taverner. Owain Park – Footsteps will be performed side-by-side with young singers from local secondary schools. In this centenary year for the end of the First World War, the Armistice is further commemorated in a programme of British string classics with Chamber Domaine under the baton of Thomas Kemp. Legendary actor, Charles Dance OBE, narrates the programme with readings from Siegfried Sassoon and his rediscovered correspondence with leading figures from the 20th century. The Master of Queen’s Music Judith Weir CBE is profiled across five concerts with Meet the Composer events and a study morning exploring her music. Debussy 100 – the composer is featured in four concerts including Chamber Domaine at Pilsdon Barn performing the three sonatas written at the end of the First World War dedicated to those fighting at the front. Leading young pianist, Vanessa Benelli Mossel performs Debussy Préludes and Suite Bergamasques. Outstanding organist, Rupert Jeffcoat, performs an arrangement of L’Après-midi d’un Faune as part of an organ recital featuring works by Elgar and Weir and renowned Tippett Quartet perform two classic quartets by Elgar and Debussy – a work which was dedicated to Eugène Ysaÿe. Eugène Ysaÿe – ‘The King of the Violin’ – is a featured composer. One of the greatest of all virtuosi, a brilliant conductor, teacher and composer, his complete Sonatas for Violin are performed by Thomas Bowes in Malling Abbey. Rarely heard works also feature in recital given by Richard Harwood and by Chamber Domaine in The Control Tower, King’s Hill. Bach Pilgrimage – one of the world’s finest guitarists, Craig Ogden, performs the complete Bach – Lute Suites in the iconic setting of Malling Abbey. Ahead of its World Premiere at London’s V&A in November and to mark the end of the prestigious Frida Kahlo “Making Her Self Up” exhibition, violinist and vocalist Lizzie Ball and guitarist Morgan Szymanksi, will be previewing a selection of works from Corrido – A Ballad for The Brave taking musical and visual inspiration from the cultural landscape of Frida’s time in the inspiring All Saint’s Church, Tudeley with its famous Marc Chagall windows. James Pearson – Artistic Director of Ronnie Scott’s returns to give a solo recital The Inventions Reinvented – a reworking of Bach’s Two and Three-Part Inventions. Outstanding cellist and composer, Peter Gregson performs Bach Recomposed – a reinterpretation of the Bach Cello Suites for solo cello and electronics which is to be released on the iconic Deutsche Grammophon label in October 2018.
stunning church of St.Peter & St.Paul, Trottiscliffe. St Michael’s, Offham are running an Alpha course for our local Cluster starting on Monday 17th September at 7.00 p.m. with sessions hosted at the Jabez Barn next to St Michael’s Church, Church Road, Offham. All sessions will centre around a good hot meal (kindly supplied by The Swan, West Malling) and with an opportunity to hear about, discuss and ask questions about the basics of Christian faith. For those who have not heard of Alpha before, it is a free-of-charge course exploring the basics of the Christian faith, typically run over ten or eleven weeks. It started at one church in London and has since become a major enterprise with courses run all over the country and all around the world. Each talk looks at different questions around faith and is designed to create a conversation. Alpha is run all around the globe, and everyone is welcome. It runs in cafes, churches, universities, homes – you name it. No two Alphas look exactly the same, but generally they have three key things in common: food, a talk and good conversation and open discussion. Alpha is perfect for two groups of people. If you are a churchgoer and want to do a refresher on the basics of your Christian faith and perhaps fill in a few gaps in your understanding or ask questions you never get to ask, Alpha is for you. Alpha is also great for anyone who doesn’t currently call themselves a Christian, but is interested in exploring God, the meaning of life and the big questions we all ask, and examining what Jesus and the Christian faith has to offer. If you’re still wondering, you can watch an introduction video online via YouTube. Contact us now to book your place or if you have a question you’d like to ask before you book in. There’s a maximum limit of 20 people and it is starting to fill up! Mothering Sunday this year is Sunday the 11th of March. 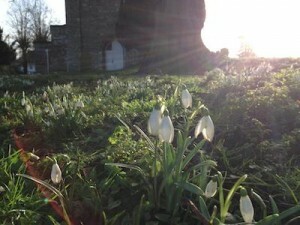 Traditionally a time in which people returned to their “Mother Church” (the church were they were baptised), today it is widely recognised as a day to celebrate mothers, motherhood in all its forms and to support and comfort those for whom it is a hard day. There will be services for Mothering Sunday in Offham (at 9.15 a.m.) and in West Malling (at 10.00 a.m.). On Thursday February 22nd, St Mary’s was pleased to welcome our brothers and sisters from St Michael’s, Offham and St Gabriel’s, Kings Hill and our Archdeacon, the Venerable Julie Conalty for a special service to ‘induct and install’ David Green as the new ‘Vicar of West Malling and Rector of Offham’. Regular readers will be aware that, in December, we announced Rev David was to be made ‘Vicar and Rector’ in late January. Unfortunately that service had to be postponed but with Her Majesty’s Letters Patent in hand and able to read aloud in the service, we were finally able to move ahead. David chose the same readings and hymns that he had at his licensing service in 2011 when he was made ‘Priest-in-Charge’. They provided an interesting mirror image to the service that enabled us to both look back at his six and a half years of ministry here as well as the chance to look forward to all that lies ahead. The service was led by our new Archdeacon, Ven Julie Conalty who preached the sermon on the theme of unity (you can read the sermon in this month’s Parish Magazine – this link opens a PDF file). David was asked to renew his vows of loyalty to Her Majesty the Queen and to the Bishop of Rochester and a series of people from our three churches handed David various symbols of ministry and asked him to renew his pledges as a Minister. Perhaps most moving of all were a couple of children – sisters Lizzy and Immy from Offham who came forward to ask David: “Will you in the strength of the Holy Spirit, continually stir up the gift of God that is in you, to make Christ known among all whom you serve?” He promised Lizzy and Immy and all of us that “By God’s help” he would do so. 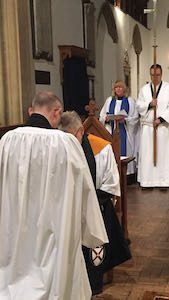 The Archdeacon of Tonbridge read aloud the Bishop’s licence and then instituted, anointed and blessed David for service in these parishes. As is common in such inductions, David was then taken to the front doors to be handed his keys (a symbol of his stewardship of the care of the buildings), taken to the bells to ring them, thus indicating he had taken up his role, and finally to his priest’s stall where Julie took him by the hand and placed him in position! For the uninitiated, what’s changed? When David was appointed in 2011, he was licensed as ‘Priest-in-Charge’ of our parishes. While the job he has done for us in these last six years has been identical in almost every respect to that of a Vicar, this formal ‘upgrade’ in his status as our Minister does give him a better security of tenure in his role, and it represents an important step forward for our parishes. Vicar, Rector – what’s the difference? The difference is largely historical and has to do with money. In the days when Tithes were paid in England someone was entitled to receive that money. Where a church paid that tithe to the Incumbent, he was a Rector. Where someone else got the tithe and they had to appoint someone ‘vicariously’ to lead the churches on their behalf, that person was called a Vicar. The seventh Music@Malling Festival returns to West Malling this month. Outstanding artists will be performing an eclectic mix of great music in historic venues from the 21st to 30th September. The festival kicks off at The Farmhouse in West Malling with Lizzie Ball and friends performing music ranging from Bach to Bluegrass. James Pearson, Artistic Director of Ronnie Scott’s, makes a welcome return performing Bachology with his legendary trio and James will be also be a soloist in Gershwin’s Rhapsody in Blue with the fabulous Callum Au Big Band. Bach features in seven concerts including the complete Violin Partitas and Sonatas with virtuoso violinist, Thomas Bowes, and a concert given by the internationally renowned organist Kevin Bowyer at the Chapel of St. Augustine, Tonbridge School. Classic FM Artist, Craig Ogden, will be performing a guitar recital in Birling and Finnish flautist, Sami Junnonen performs Bach alongside the music of our time in the spectacular setting of St.Peter and St.Paul’s, Trottiscliffe. We commemorate the First World War this year with concerts at Pilsdon Barn Chapel and The Control Tower, Kings Hill with works written during the conflict. The outstanding cellist Richard Harwood performs the cello suites of Max Reger at Malling Abbey. These rarely heard works are a fascinating, modern take on Bach. Richard is also the soloist in Elgar’s Cello Concerto in a concert alongside works by Vaughan Williams including The Lark Ascending. 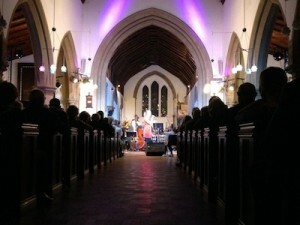 Chamber Domaine perform side-by-side with musicians from across Kent. The music of contemporary composers Alexander Goehr and Paul Patterson are programmed across the festival. Hundreds of primary school children will be involved in a project based around Roald Dahl’s Revolting Rhymes. The concerts are the culmination of a groundbreaking education project engaging young people with creativity and performance. The concert includes a performance of Paul Patterson’s Little Red Riding Hood. All Saints’ Church, Tudeley, with its Marc Chagall windows, will be the spectacular setting for a performance of Messiaen’s Quartet for the End of Time. James Pearson opens the concert with an improvisation and Chamber Domaine, with composer and clarinettist Mark Simpson, perform this iconic work which was written in a concentration camp. Music@Malling are very grateful for the help of a wide range of national, regional and local supporters. The festival promises to be a memorable series of events!